But we also welcome users to submit other demos that might be useful, and also link to their own applications that have been created with ImageEn. Please upload your demo by posting a reply and clicking "attach a photo or zip" (full source demos only, with an EXE). When linking to a demo or application please advise whether it is full source, free or $$$. If possible, also include a screenshot. 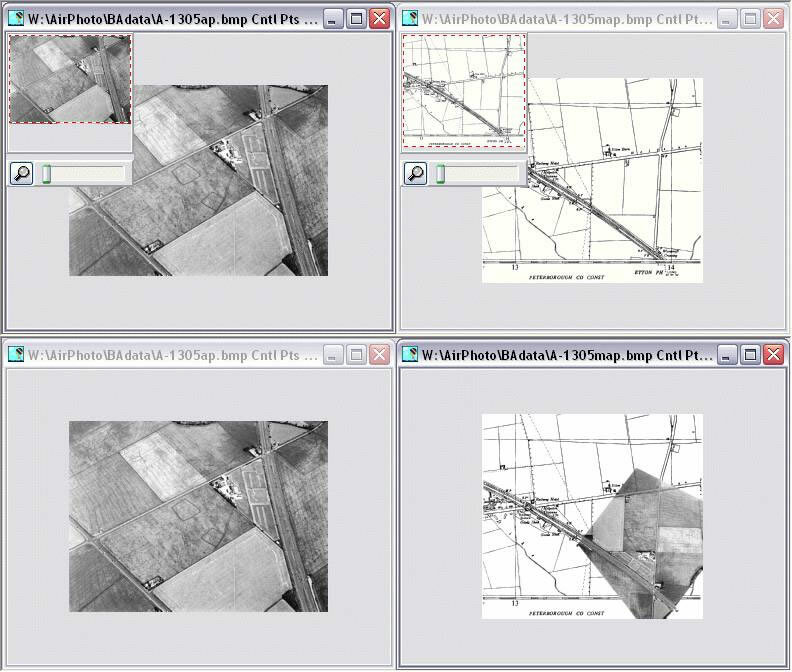 AirPhotoSE is a simple program for the rectification of perspective distortion in aerial photographs. It requires an image and a map along with a set of matching points (control points) for each. A single non-aerial image may also be used and corrected arbitrarily to create a new image of the same size. 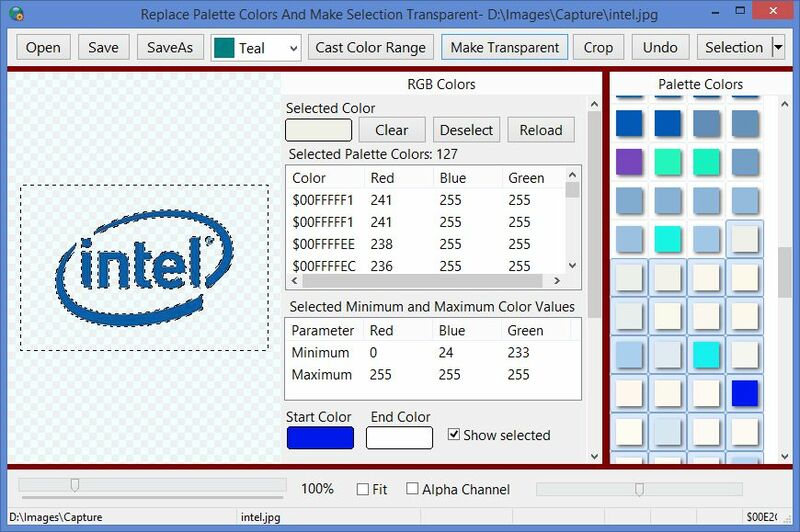 Shows how to select all colors within a range and cast them to a new color. Compiled with DelphiXE4, but is expected to compile with Delphi 2010 or higher. The "Select Similar Colors Demo" and this enhanced version that makes complex selections transparent required significant development time so a donation of $9.95 is required. This demo shows how to create transparent backgrounds with complex images with many similar background colors. This particular image has 127 background colors of "off-white" out of a palette of 255 colors to render as transparent. 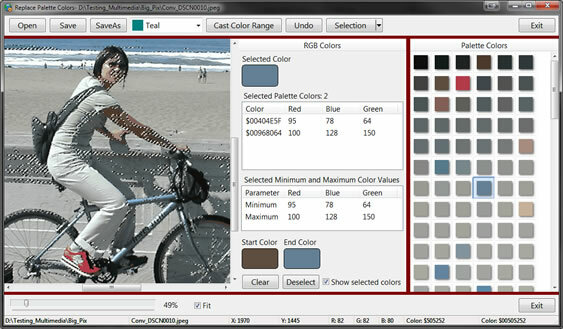 The demo selects palette colors in an image by calculating the minimum and maximum RGB values of the selected colors and selects the corresponding pixels in the image. It renders the transparency by calling SetSelectedAreaAlpha(0). This is the saved transparent image from the demo saved as a png image. Rendering a complex background has been one of the most difficult problems to overcome with ImageEn because CastAlpha and SelectColors have been problematic and often a time consuming process for the user when trying to set the correct tolerance value to select the proper pixels. Even though this sample image and many others I have tested has a large number of similar background colors, the math used in this demo produces the correct result and excellent looking transparent images very quickly. Another advantage with is this is if you happened to select a palette color what you do not want to render transparent, you quickly see the results visually so you just select the reset button and reselect the colors. If you do not select all the background colors the first try, all you have to do is to continue to select additional colors. Unfortunately there is no simple code to make transparent backgrounds with complex images that have many shades of "off-white" in the background that will work for all images... it just is not possible. This demo shows how to implement horizontal touch panning and viewing of images which are loaded in a separate thread. Fifty 18 GB image files load in a few seconds. 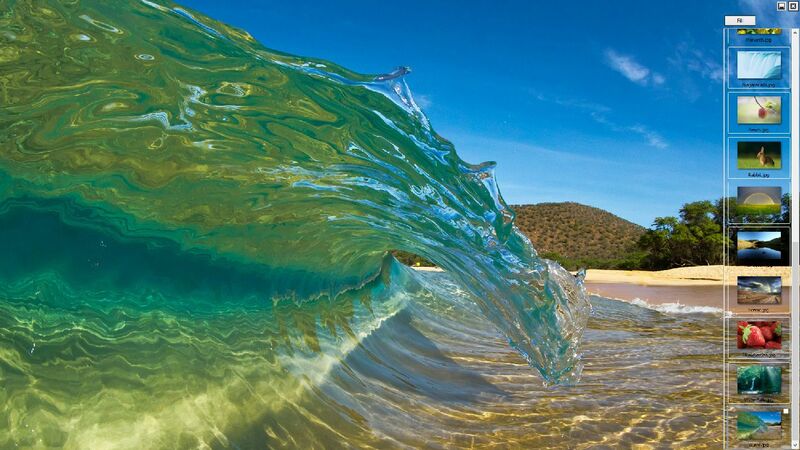 Images may be panned left and right with touch swipes or by moveng the mouse over the pictures. Selected imaged may be auto enhanced and saved to disk. Update includes using a stringlist for a most recent files list in place of a third-party component. Added Insert image frame. Added drag and drop images to reorder the image frames. Added frame move up. Added frame move down. Added resampling all frames to the same dimensions. 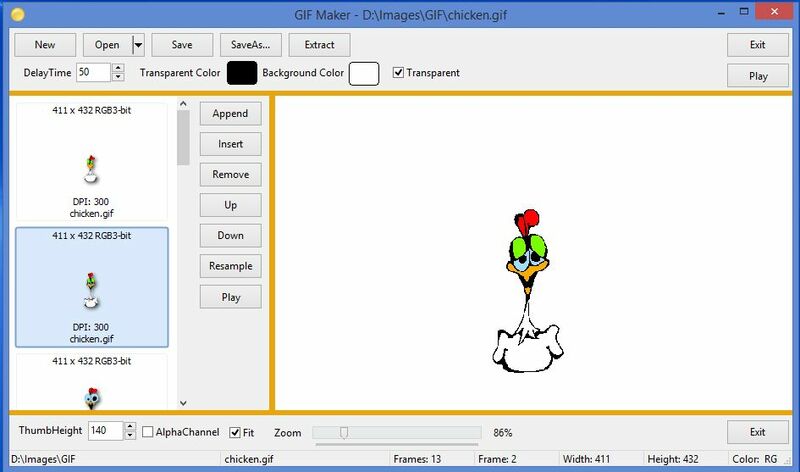 This demo supports open, save and play multi-frame GIF images in TImageEnMView and TImageEnView. Set the Gif delay for selected frames. Delay is not set until the image is saved. Append image frame. Insert image frame. Drag and drop images to reorder the list. Remove selected image frame. Play Gif in TImageEnMview and in TImageEnView. Extract a selected frame and save to disk. Display selected frame with ImageEnView. 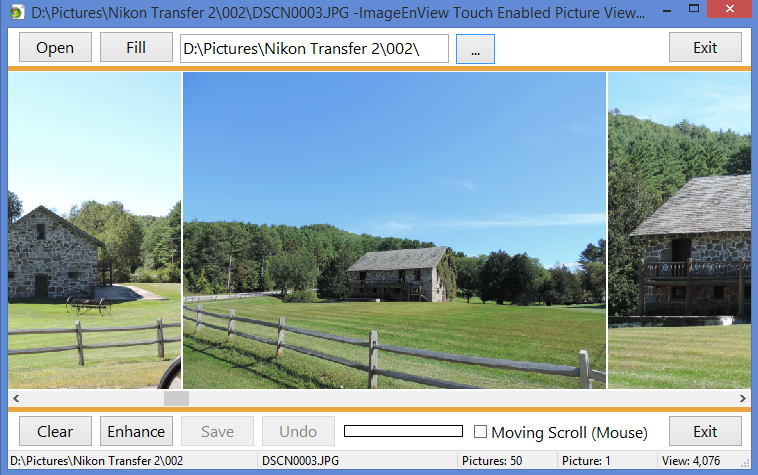 ImageEnView supports touch zoom and pan gestures and mouse zooming and scroll. icons. The demo supports transparent base bitmaps and the 650 glyph objects that are included supplied support transparancy as well. When finished, the new glyph is saved to disk with a new filename. Some of the glyphs in the demo were created with the demo. when the app starts so that application start up is as fast as possible. components were used to develop this demo. Shows how to use the Threshold procedure. Compiled with DelphiXE4, but is expected to compile with Delphi 2010 or higher. Requires ImageEn version 5 or higher to compile without changes. 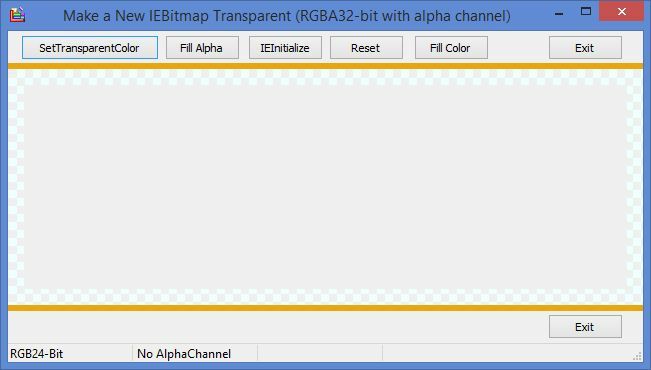 This demo shows three ways to make a new bitmap transparent. IEInitialize requres ImageEn version 5 or higher that has iexhelperfunctions.pas. 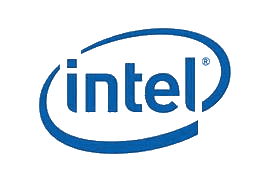 To compile this demo with ImageEn version less than 5 then remove iexhelperfunctions from uses and remove IEInitialize1Click. 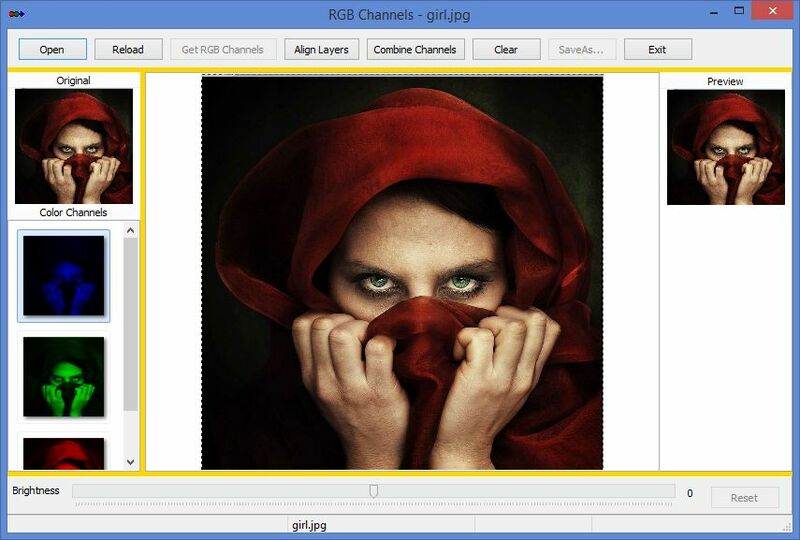 This demo shows how to separate the RGB color channels of an image, change the brightness of a selected color channel, then combine the color channels into a RGB Composite image. Acknowledgement: Sinisa Petric for some ideas discussed in the forum. Here is a source code for binding Lua with ImageEn. Demo exe included. past and copy content into memo field and press execute. Edit: you can modify code inside memo field (set various params etc...) and press execute to see your changes. This demo show how to use TImageEnList to store images, make changes to an image and replace an image in the TIEImageList with an edited image. 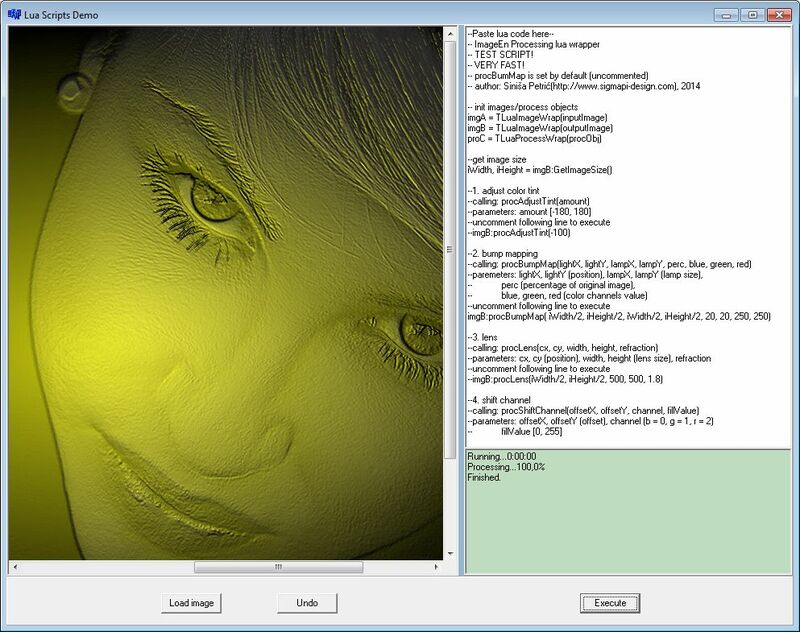 This demo does image processing in a secondary thread. Trackbars can be used to change image brightness, contrast, and saturation in a secondary thread. Before each processing event the a copy of the original image is used for the processing to provide the optimum result. AutoImageEnhance 1, 2 and 3 are a one step process that does not use trackbars, but consume a significant amount of time so these are threaded as well. The thread system is designed to easily be add other image processing procedures. The demo also includes Undo and Reset (all undo) and Most Recent Files (MRU) image opening as well as Save and SaveAs. The thread class can easily be copied and implemented in your own application with for your specific processing needs. You must add some code to the thread for your own processing procedure using techniques used in the thread for new procedures. Image processing is very fast as the trackbars operate on a thumbnail of the full image. "Apply" buttons for each task is also provided to apply the previewed effect to the full image which is also run in the secondary thread. The thumbnail preview as well the full image effects can be undone. Compiled with DelphiXE4, but is expected to compile with Delphi 2010 or higher. Requires ImageEn version 5 or higher because it uses iexhelperfunctions, but can be modified to compile with earlier versions of ImageEn. This demo shows how to assign one TImageEnVect to another TImageEnVect, how to assign IO.Params from one TImageEnVect to another TImageEnVect and how to synchronize the zoom, scrolling (View) and objects between two different TImageEnVect's. Object selections, additions and deletions are synchronized between the two vectorials. 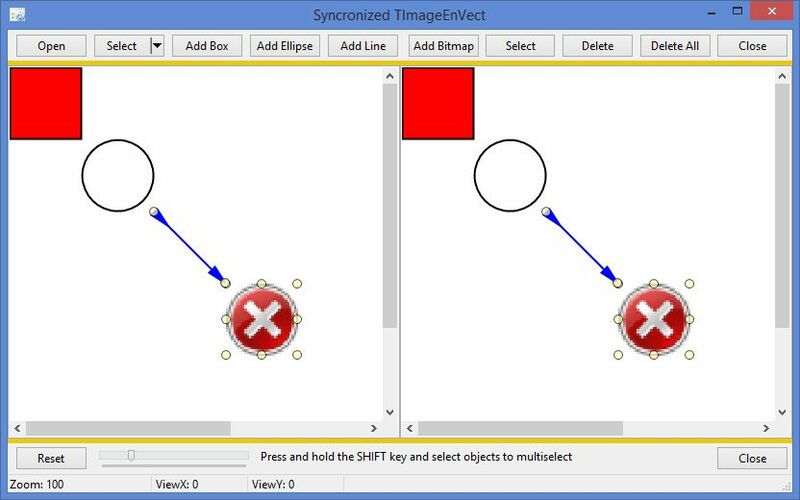 To operate the demo, select the Add Box, Add Ellipse, Add Line and Add Bitmap buttons to add 4 objects. Then select the Select Button to select objects in either ImageEnVect. Select the Delete button to delete selected objects or select the Delete All button to delete all objects. After selecting an object in either vectorial, move and/or resize the objects and watch the object be resized or moved in the other vectorial. Press and hold the SHIFT key and you may select multiple objects. Select the Reset button to clear. 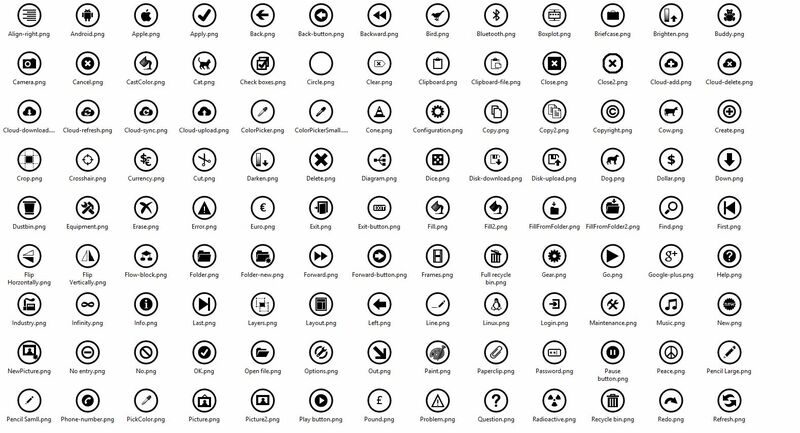 The zip file contains a 434 of windows 8 style icons with an icon inside a black circle. I created a lot of these by hand while some were obtained from the web. Includes 32x32 and 64x64 size glyphs. Additional glyphs added since original post. TImageEnMView does not support transparency which is a "show stopper" when creating an application that uses transparent panels placed on top of TImageEnView to hold various controls including ImageEnMView. Over the last several weeks I have searched extensively for a thumbnail component that supports transparency for a clients application and was unable to find one. I also tried various skinning components to achieve transparency, but those attempts failed as well. After much thought and experimentation I was finally able to achieve an illusion of transparency with TImageEnMView. I decided to release a free demo to show ImageEn Developers how this can be accomplished because I spent so much time and research trying to render TImageEnView "transparent". This demo illustrates how to achieve an illusion of transparency with TImageEnMView. This provides a satisfactory illusion that mageEnMView is 100% transparent when actually it is not transparent at all. This demo uses a TImageEnView client aligned to the form. A TPanel is placed on TImageEnView and is aligned to the right. A TImageEnMView is placed on the TPanel. 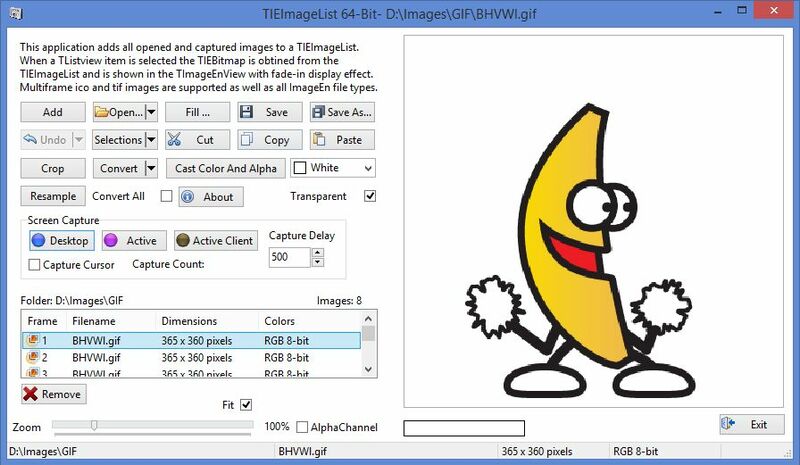 An illusion of transparency can be achieved by creating a bitmap from the image loaded into TImageEnView by using a portion of the TImageEnView.Bitmap as wallpaper for TImageEnMView. 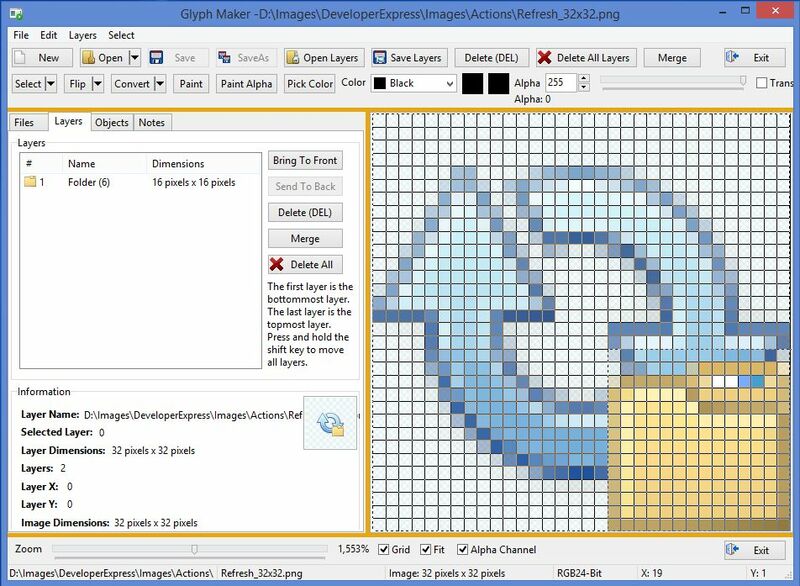 The original code used ImageEnView1.CopySelectionToBitmap to load the wallpaper. The revised code to load the wallpaper was developed by Nigel Cross and it uses PaintToEx and CopyRect to obtain a bitmap of the image under the TImageEnMView. This improved code is faster than the original code, eliminates the need to use a selection and works at all zoom levels. Here is one simple demo showing the usage of Douglas-Peucker polyline simplification algorithm and Catmull-Rom spline drawing. After free-hand polyline is drawn in ImageEnVect (miPutPolyLine), you can simplify polyline by pressing "Simplify" button, or construct spline curve by pressing "Spline" button. 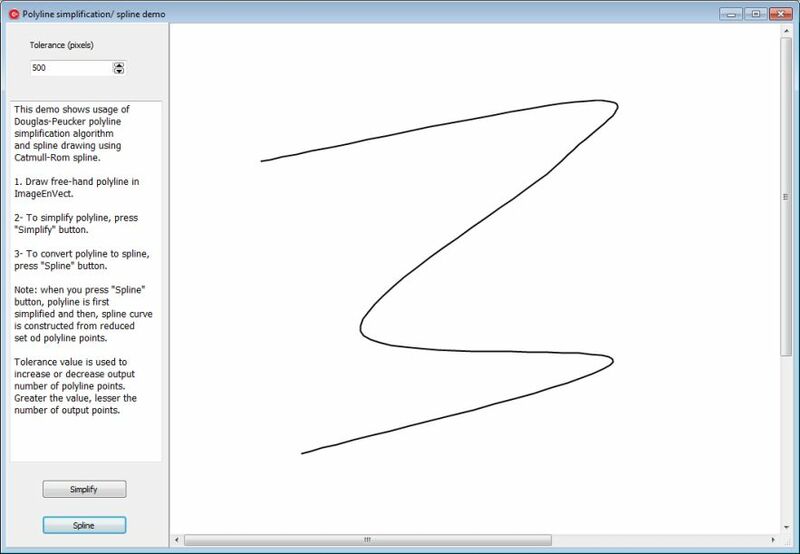 NOTE: Spline curve is constructed from simplified polyline, ie. simplification is automatically performed prior to spline drawing. This is a sample of an fx effect using voronoi diagram. I think it is quite cool and work well as an fx. I did use the "voronoi diagram in regular grid" lua script found in the Lua binding post by spetric to learn how to create a Voronoi diagram so cred to spetric for his contribution. If you improve the effect regarding speed or result I sure would like to see it. I do hope you find it interesting and useful. That's a really cool demo. I enjoyed playing with it a lot! I had a look at some of the other demos too at rmklever.com. Nice work. Great demo, Roy. Thanks for sharing. Great mosaic fx! I have extended "Voronoi diagram in regular grid" scrip to accept not only square grid, but also rectangular grid, where cells can also be shifted in order to create "brick-style" layout. Because of this, I made a slightly modification in algorithm, in the part where neighboring cells are inspected (function find_closest). I have also added various intensity fall-off modes (lines 144 - 146). I forgot something. A really cool enhancement in your demo would be to add multipass mosaik effect. The first pass goes with big size grid, let's say 60. The second pass goes with half size (30) and prior of drawing each "cell" checks average error inside new cell against some threshold value (difference between pixels of original image and image created in the first step). If average error is above specified threshold cell is drawn, otherwise not. The same thing goes for the third pass and so on. 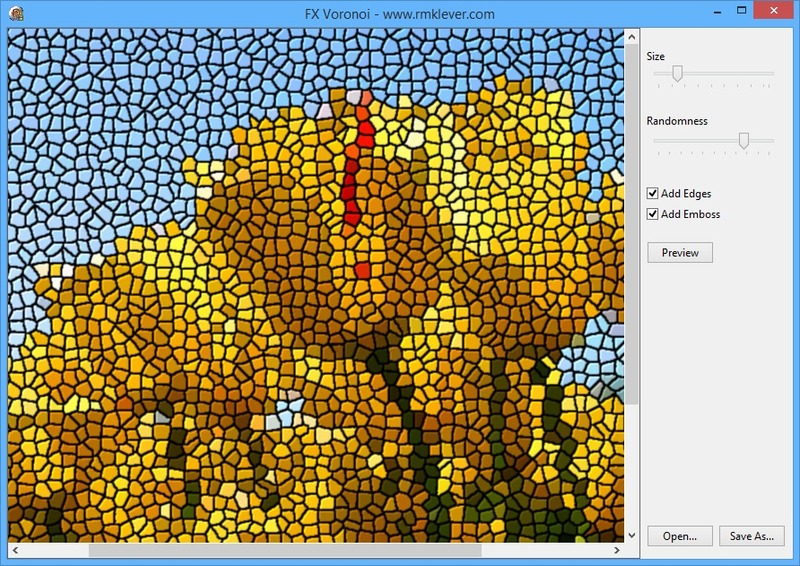 Alternative solution, in one pass, is to perform some adaptive seeding (more points in areas with more "color changes") and then perform general Voronoi tessellation, using Fortune's algorithm. I think I saw Fortune's algorithm implementation in Delphi somewhere on the web.